"The carrots and pineapple work together to keep this cake moist and wholesome." I modified this recipe by substituting 1/2 cp. of oil for 1/2 cp. lowfat buttermilk. I also added an extra teaspoon of baking powder. The results were just as tasty. A definite "keeper" - moist, delicious and not too sweet. I substituted applesauce for half of the oil and added yellow raisins. The cake, and frosting, were perfect. 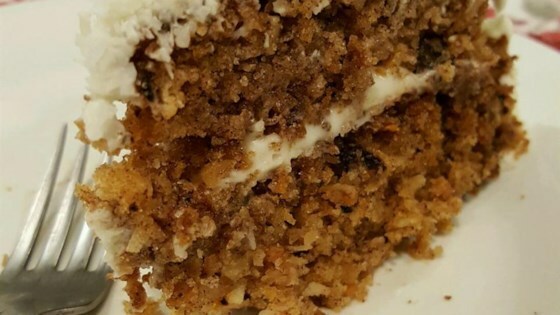 this is the best carrot cake recipie/cake i have ever tasted,what ever negative ratings you might see can only mean the cake was not done right.love it thank you Linda!!!!!!! !